Description: HI EVERYONE..I HAVE BEEN HAVING SCRAPERS BLOCK...OR SOMETHING NO LAYOUTS IN OVER A WEEK....I HOPE I'M BACK????? THIS IS A LO I DID FOR A CHALLENGE W/FABLADY SEPT. TEAR AND FOLD. I TORE AND FOLDED QUITE A BIT. I USED A BRICK WALL DCWV SHEET BEHIND THE BG BLUSH SHEET..I THEN PAINTED THE LINES ON THE BRICKS TO LOOK LIKE MORTAR. I USED THE CRACKLE PAINT ON THE PHOTO AS I HAD SEEN FROM VINTAGE ME...LOVE IT!! THANKS SO MUCH!! I USED THE PHOTO CORNER AS A TWIST. THE FLOWER IS MADE BY TEA BAG FOLDING , THE ONE LEAF IS TEA BAG FOLDING BUT THE STEM IS CRICUT FROM WIMG. I ALSO FOLDED THE PAPER UNDER SUGAR..THE TITLE IS CUT FROM SIZZIX WITH CHIPBOARD AND THE GLAZE TO SHINE. THERE IS A TINY GOLDEN SPOON ATTACHED. 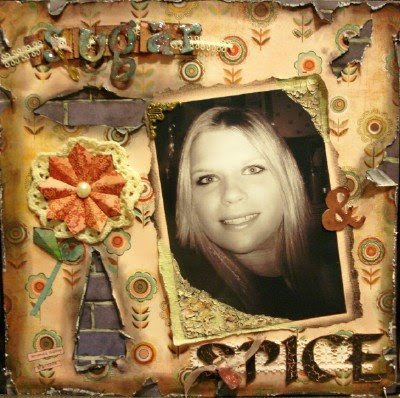 SPICE WAS CREATED WITH PAZZLES AND PAINTED WITH CRACKLE PAINT AND A TINY GLASS BOTTLE ATTACHED LIKE A SPICE BOTTLE. THIS IS MY DD AMANDA WHO IS 15..THIS IS ONE OF THE MYSPACE PICS...GOTTA LOVE IT!!! TFL!! !